Unable to make and receive calls on your copper line? Unplug all phones and equipment connected to your phone socket. Plug a phone directly into the socket and test for a dial tone. If there is no dial tone, try to carry out the test with another phone. If it still does not work, call us on 8902. We will run some tests to know the source of the problem. If your broadband connection is already on fibre and the problem lies on your copper line, we will shift your fixed voice service to fibre. We will remotely configure your Wi-Fi box and invite you to follow below steps. The configurations may take some time. We will call you to inform you when you can start using your home phone. A weakness has recently been discovered in the Wi-Fi Protected Access II (WPA2) protocol, which can allow attackers to intercept sensitive data transmitted over a Wi-Fi network. The attacker positioned within the range of the victim, uses a technique called Key Reinstallation Attacks (KRACKs) to eavesdrop on communications transmitted over the air. For example, attackers can steal credit card details, emails, passwords and so on. In some cases, it is also possible for attackers to manipulate data transmitted over the wireless network. The weakness is in the Wi-Fi standard. To prevent the attack, users are advised to apply security updates on their wireless devices as soon as they become available. Almost all wireless devices (laptops, mobile phones, wireless gateways, game consoles and other smart devices) are vulnerable to this attack. Kindly make sure that you update the operating system/software of all your devices. Where applicable, ensure that the ‘automatically check for updates’ option is enabled in System Settings/Preferences to ensure that your software is always up to date. Most operating systems’ vendors have already released necessary security patches for this vulnerability. WPA2 is a wireless security protocol used to secure Wi-Fi networks. It was developed by the Wi-Fi Alliance to block access to uninvited guests onto a Wi-Fi network, as well as to encrypt data transmitted wirelessly. KRACK exploits a shortcoming in the ‘four-way handshake’ of the WPA2 protocol. The ‘four-way handshake’ is used to establish a Wi-Fi connection between a client and an access point, whereby encryption keys are exchanged. Essentially, to guarantee security, an encryption key should be used only once. Unfortunately, this is not guaranteed by the WPA2 protocol. KRACK targets this vulnerability of the WPA2 protocol. Note: In order to execute a KRACK attack, the attacker must have a device physically between the end user device and the internet gateway. i. End user devices Ensure that all your end devices have the latest security updates. Always check for the latest software update. ii. Internet gateways Mauritius Telecom’s internet gateways (e.g. ONTs) are not impacted by this vulnerability. KRACK works on devices working in Client Mode with the 802.11r protocol. While our ONTs use Wi-Fi in AP mode and do not support 802.11r. Does the attacker have to be near my network in order to attack it? Yes. In order to execute a KRACK attack, the attacker must be between the end user device and the internet gateway. Are both home and business users concerned by the attack? Yes. End user wireless devices (like laptops, PC with Wi-Fi cards, mobile phones, SMART TVs and other smart devices) are concerned. Kindly ensure that all wireless devices have the latest security updates. Must I change my Wi-Fi password? Changing your Wi-Fi password will not prevent a KRACK attack. Instead, ensure that you download the latest security updates on all your wireless devices. Must my internet gateway (i.e. ONT) be updated? Mauritius Telecom’s home gateways (i.e. ONTs) are not affected by the WPA2 KRACK attack since they do not require security updates and do not support 802.11r. I am unable to install the latest security update on my mobile phone. What shall I do? If you are doing an important transaction online and you are concerned that others may be eavesdropping, disable Wi-Fi on your phone and use mobile data. Retry to update your software. Look for websites starting with https when you are doing important online transactions, like online banking. How to protect my business from this vulnerability? Make a list of all the wireless devices in your company. Check out for the latest software releases for each device and update accordingly. You are not getting my.t channels on your TV? Try changing to a different TV channel to see if the picture improves. If it’s only occurring on one channel, the problem’s likely to be with that particular broadcaster. Wait for a few minutes and then try the channel you were watching again. If you are experiencing slow internet speeds when browsing or downloading, there are a few things you can do to try and speed up your internet connection. The first thing we suggest you do is reset/suspend any other Internet activity or network activity if your PC is a part of a network. Remember that if you have any peer to peer software open, other Internet users may be uploading files from your computer's hard drive. This will have an impact on your internet connection. We suggest that you delete your cookies, and reset your browser, to see if this improves your internet speed. It's a good idea to exit applications you don't need when you're surfing the internet, particularly if your computer has less than 128MB of RAM. It's also good practice to limit the number of windows that your browser has opened at the same time and close web pages that you don't need. If you've got printers or scanners attached to your computer that use a USB cable, these can cause connection problems. Try unplugging these devices to see if the slowness problem is solved. If you're trying to download an attachment that's more than 2MB using Outlook, this could block your connection. To check if you have a stuck email, please check your email on your webmail. In your Inbox, you will see emails that have not been downloaded locally to your Outlook and you can delete emails with large attachments. It's also worth noting that web pages will take longer to load if you're simultaneously downloading a large email. If your modem cable is not plugged in securely to your filter and PC, you may not be able to connect or your connection could drop. Make sure you've got a good quality cable with no kinks, that reaches comfortably between your computer's modem and the phone wall socket. You may see your speed reduce during peak times. The busiest time is from 6-11pm. If you need to download large amounts of data we suggest that you do so outside peak time. Some websites have a maximum access speed, therefore you may experience slow speeds on specific websites. Viruses and spyware can have a serious impact on your connection speed so make sure your computer is protected. Download an anti-virus (free anti-virus software are available on the web) or if you already have one, please ensure that it's up to date. If your modem and PC are connected via Wi-Fi/USB, swap your connection to Ethernet/LAN. If you've been using your PC for a while, the hard disk may have become 'fragmented'. This means its storing files in small parts, spread across many different places on the drive. This has a detrimental effect on speed, as it takes time for the computer to find and compile all the parts when launching a program or open a file. We recommend you 'defrag' your hard disk every few months. Please seek assistance from your PC Vendor and/or Technician for assistance. Frequent internet disconnections is when your internet gets disconnected by itself in intervals that can vary from 2 seconds to 30 minutes. When your internet gets disconnected, your DSL/Link/@ LED light of your modem will blink and become stable again after a few minutes, when the connection is back to normal. During disconnection, you will have no internet service. If you are experiencing frequent internet disconnections, there are a few things you can do to try to resolve this problem. 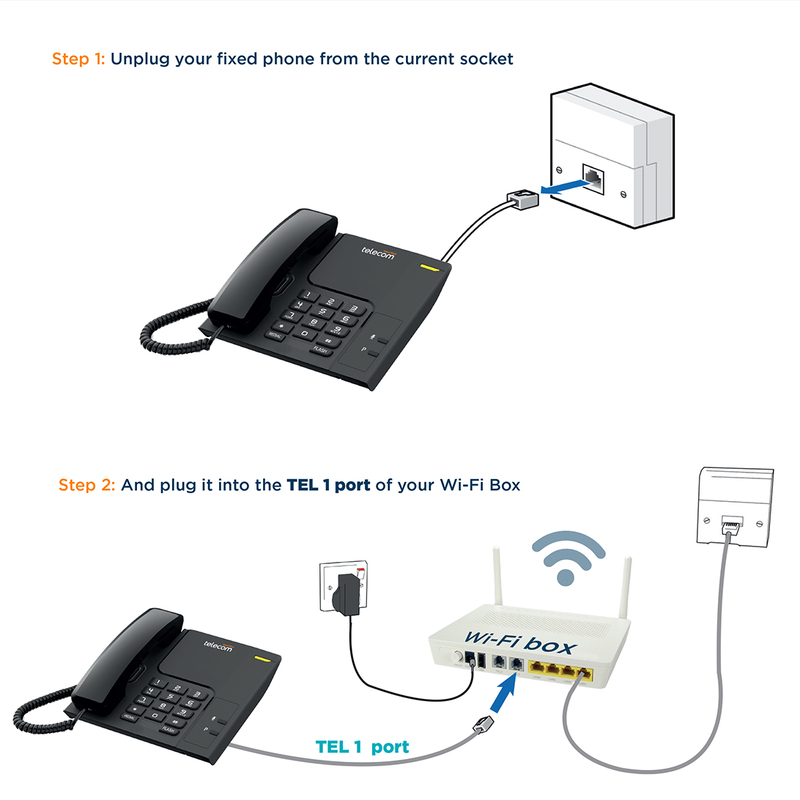 Disconnect all telephone extensions whereby terminal equipment such as fax, cordless phones, CLIs indicators, alarms are disconnected. Move your cordless phone base the further possible from your modem. Remove the splitter and try the connection again. If the connection becomes stable without the splitter, your splitter might be faulty and you need to get a new one. Detect whether you are getting frequent disconnections whenever certain electrical appliances are being used around your modem e.g. microwave oven, other wireless networks (Bluetooth, mobile phones, cameras), TV repeaters, alarms and faulty power supplies. Try to isolate the source of the interference if possible. Sometimes frequent disconnections may also be caused by public lighting and high tension power cables. Is the LED on, blinking or off? If LED is on or blinking, unplug and plug back in your modem power adapter. You will have to wait for approximately 5 minutes for your modem to re-start and synchronise. In case you are experiencing problems on your my.t TV channels and/or VOD, there are a few things you can do to try to resolve this problem. In case a VOD has been ordered and cannot be re-launched, check if delay of 7 days has not expired. You usually get 7 days from the time you bought a VoD to watch it. After 7 days, you will not be able to watch the VoD again. On your remote control, press Menu followed by yellow and blue button, delete cookies and restart the set top box. Enter your TV login and password again on your TV. Your login will be your my.t phone number and password = 1234. You are moving houses and would like to transfer your MT fixed line to your new address. If you are moving within the same area that is covered by our exchange, you can sometimes keep your existing phone no. (if it's registered under your name). If you are moving outside of the area, then you will get a new phone no. on your new line. How long will it take to provision a fixed line?